SHERLOCK GNOMES is the 3D animated sequel to the 2011 successful animated GNOMEO AND JULIET. 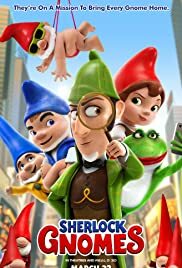 In case one is wondering what Sherlock Gnomes has to do with the original characters, SHERLOCK GNOMES the sequel has Gnomeo and Juliet in it, as two of the main characters, once again voiced by James McAvoy and Emily Blunt respectively. Michael Caine and Dame Maggie Smith reprise their voice roles (immediately recognizable) as gnomes Lord Redbrick and Lady Bluebury. When the film opens, gnomes are being stolen from gardens in London, England. They will be smashed and destroyed within 24 hours unless Sherlock Gnomes (Johnny Depp) and Dr. Watson (Chiwetel Ejiofor) foil the culprit who turns out to be Professor Moriarty (Jamie Demetriou). He is foiled in the London Museum of Natural History and presumed dead. The film then switches to the garden of Gnomeo and Juliet where Juliet is given the task of making the garden work by spring, the next season. But gnomes start disappearing once again and Sherlock establishes that Gnomeo and Juliet’s garden is next. It is! All the gnomes go missing except for Gnomeo and Juliet who happen to be out of the garden at the time. The four solve the mystery and save the day – and the garden! Stevenson is no newbie to animation having directed KUNG FU PANDA and worked in the art department of the SHREK films. SHERLOCK GNOMES benefits from his experience as evident in the humour that caters to both kids and adults. For one, the bond between Holmes and Dr. Watson and enmity between between them and their arch enemy Moriarty as in the Sir Conan Doyle novels are kept respected. The villainous Moriarty is fashioned after Batman’s joker in his laughter and antics, he even saying like in the BATMAN film, that there is a love affair between him and his enemy. Jamie Demetriou does a marvellous job voicing the cartoonish villain, as do his animators. Sir Elton John executively produced the film and his songs are featured in the film. There is even an Elton John gnome playing a sparkled piano. Immediately recognizable is “Don’t Go Breaking My Heart” that is played during the opening credits. The song is relevant to the film’s message. The story involves the respect between Holmes and Dr. Watson and between Gnomeo and Juliet. Both couples are having relationship problems that need to be solved. These are serious issues dished out for the adults while the younger audience can relish the childish gnome dances. The animation is impressive especially of the gargoyles that guard the kidnapped gnomes. The gnomes are also sufficiently detailed in their 3D looks. Of the voice characterizations, Ejiofor and Demetriou stand out. Johnny Depp gets away with his British accent as Holmes. 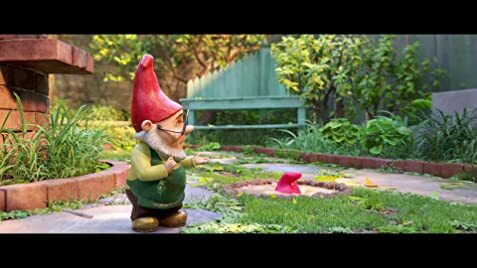 SHERLOCK GNOMES’ budget comes just under $60 million compared to GNOMEO AND JULIET’s $36 million. It is still a bargain considering Disney’s expensive animated features. The almost perfect family film!